Hi everyone! Life has been pretty busy these days, making sewing almost nonexistent. But I have some great friends in the sewing community that keep me in the game! Gillian of Crafting a Rainbow asked Heather of The Pug and Needle and I if we would be interested in a little group challenge where we would each buy the same fabric from Blackbird fabrics, make a secret project and post it on the same day. Yaaaaas! I was definitely in! Gillian contacted Caroline at Blackbird Fabrics to ask her to choose the fabric for us….making it even more interesting. We would have no idea what we would be getting. How fun! Caroline so kindly said she would not only choose a fabric for us but wanted to give the fabric at no cost!! So nice! 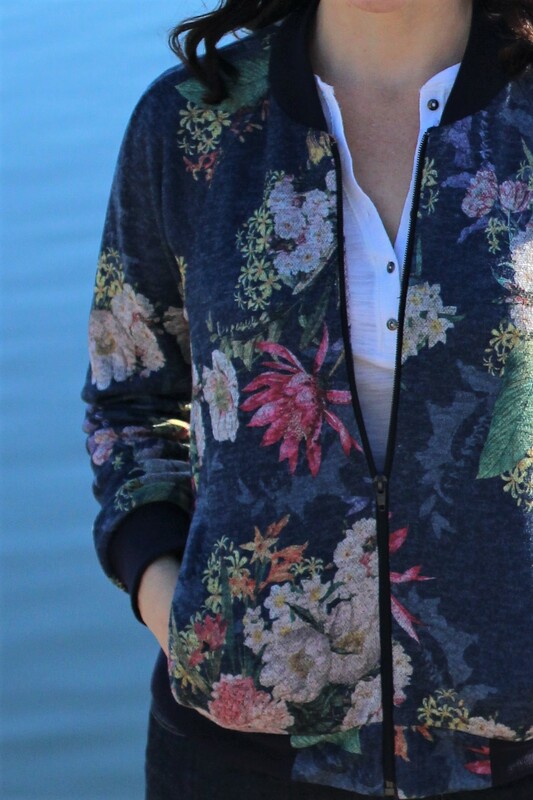 Not long after, we received our packages… it was this gorgeous floral knit! It is already sold out…but don’t worry there are so many other great choices. I recently ordered four knits that I just love. Caroline has such great taste in fabric! When I first got my fabric, I was tempted to make the Blackwood cardigan but after going through my Pinterest page, I decided to go with McCalls 7100. 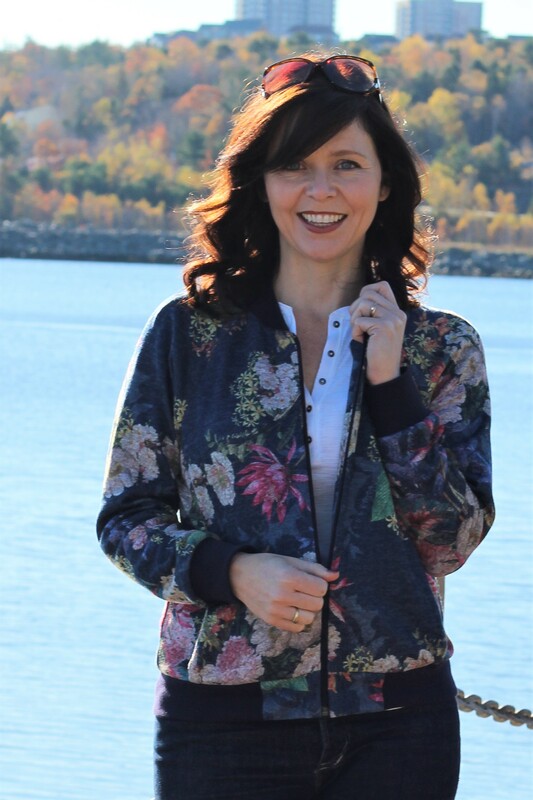 I have been wanting a floral bomber jacket and this cozy knit makes it a perfect layering piece for fall and winter. 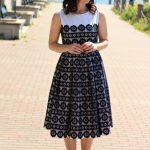 The pattern and fabric made a perfect pairing. When choosing the rib knit for the collar and bands, I had trouble deciding between the navy and a heather grey. 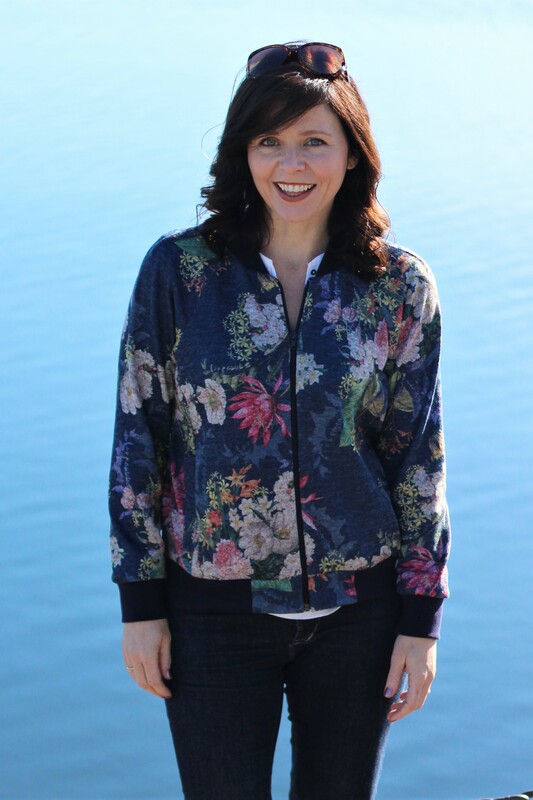 While I really liked the look of the grey with the muted palette of the floral…the navy won because I knew that I would be mostly wearing this with my Ginger jeans. The pattern has two pocket options, welt or kangaroo. I used the welt pockets because the underside of the fabric is white and I didn’t want to be able to see it. The welts are a little bit bulky but work. 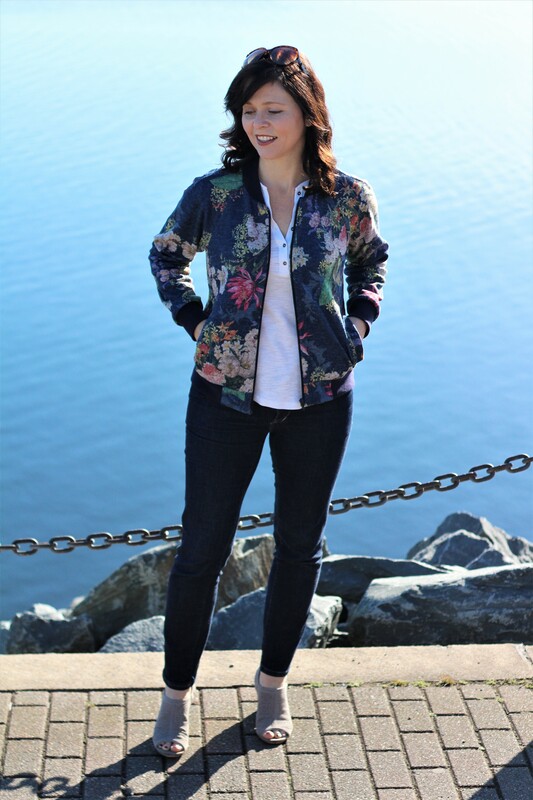 If you are looking for a bomber jacket pattern, I highly recommend this one. I didn’t have much time to fuss with this make and the raglan sleeves made it so much quicker. Go check out Heather and Gillian’s posts today. Also, if you are looking for fabulous fabric to add to your stash (cause we ALWAYS need more!) check out Blackbird Fabrics….especially if you are in Canada…the shipping and duty savings are so much better than ordering from outside Canada. Just saying…. It was so fun to have this little “challenge” to do with friends! Thanks Gillian for suggesting it. 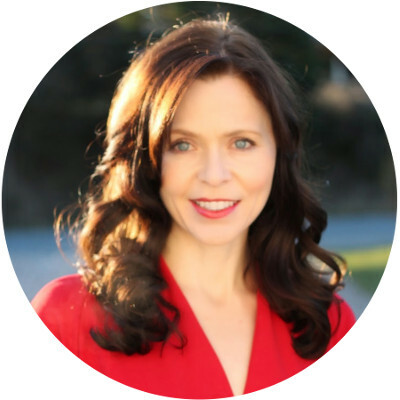 When I started this blog, I never dreamed that I would have the opportunities and fun that I have had! The sewing community is so kind, encouraging and all around great. Came over from Gillian and had to say how great this jacket looks! Thanks For visiting Victoria! It was fun to do this little project with friends! Margo…fabulous, fabulous! In truth, all three of you lovely gals nailed it! It’s so fun seeing three different makes with the same gorgeous fabric. Blackbird for the win! Hope school is going well! It’s awesome that you are doing something that you’ve long wanted to try. You’re so sweet Sue! Thanks. School is going great, I feel very blessed to have the opportunity to do it at this point in my life. Super cute! And a fun idea!! Thank you! It was fun planning it too. 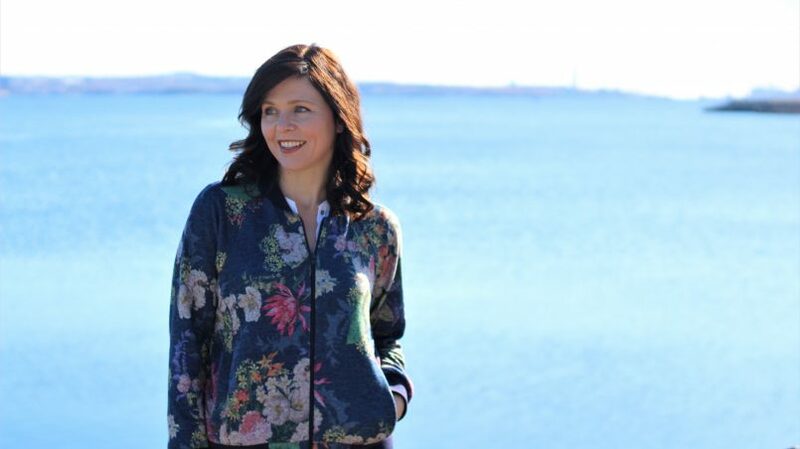 Great choice, your boomer jacket is gorgeous! I should be thanking you! It felt great to be sewing! Anytime you come up with another adventure…I’m In! 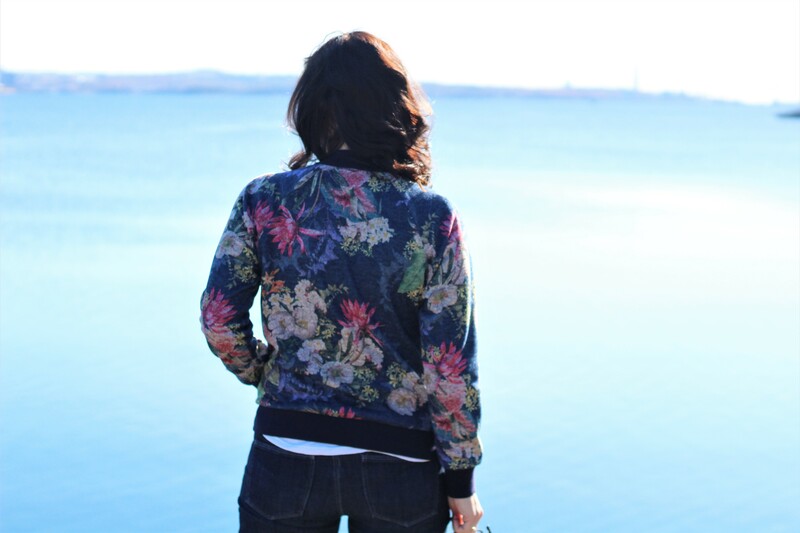 Beautiful jacket, Margo! I enjoyed seeing the different makes with this gorgeous fabric! So nice you took some time to ‘create” with your sewing friends. Thank you Almeda! School is going very well, thanks. Thank you Yvonne! I’m glad that i finally made one, it’ll be a great addition to my wardrobe. It’s stunning! So perfect to throw on over jeans. It’s a really great make. Thanks! I think that I’ll be wearing this a lot!